After the success of our first forum, we were very excited to announce our second forum which was held on Friday 22nd March 2019! "Presentations were interesting/engaging and useful - great food - and directions/parking arrangements were excellent"
"The presentations by speakers were very relevant and the networking opportunities are great"
"Good venue, good to interact with other professionals. Great food, good speakers"
"The guest speakers helped to provide context and practical application cases"
"The chance to speak to peer at varying levels of experience is invaluable for me"
"Broad mix of industries, and plenty of opportunity to network"
11:00 – REGISTRATION & NETWORKING with refreshments of tea, coffee & a wide range of herbal teas along with biscuits for dipping! 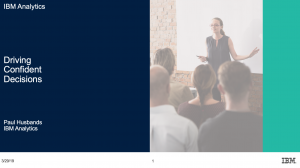 We explained that we wanted to provide a forum; where people could come along and find out how analytics can be used to add value to their business. The forum aim is to be an excellent networking and knowledge sharing opportunity, with meetings every four months, including featuring guest speakers, industry experts and hands on sessions. Chris Booker, DeeperThanBlue’s Sales & Marketing Director, explained who DeeperThanBlue are and the range of services and capabilities that they offer. There was a short round of introductions by all attendees, where everyone shared information about their current role and their interests in the forum. Paul explained the opportunity for Analytics to add more value as companies progress through the Analytics lifecycle. Also how ‘unlicensed drivers’ can often lead to a distrust of data – with missing, incorrect, misleading and misinterpreted elements. This in turn is eroding value and hampering progress. First off, was an introduction to CW Fletcher and an overview of the Aerospace and Nuclear Manufacturing they provide. Rufino explained his own career journey so far, having worked with the Advanced Manufacturing Research Centre (AMRC) and the University of Sheffield. 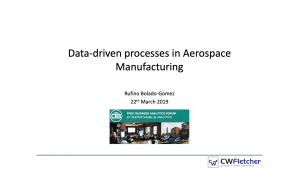 He explained some of the key projects he has delivered, including an overview of how he is using data visualisation techniques to display manufacturing within tolerances and how statistical process control is used within CW Fletcher. The benefits they would achieve from the integration. Rufino talked about using a SQL database to store the data with integration and data capture from IOT. Also, a range of tools from open source including Python to Mind Foundry and IBM Watson Data Studio. He explained that the merging of IT (Information Technology) and OT (Operational Technology) will lead to new opportunities and further value. 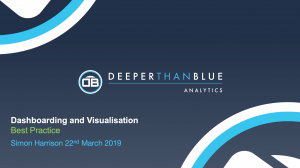 Simon shared his knowledge and experience gained from years of presenting management information to senior management, Simon presented ‘Data Visualisation best practice’. Which was one of the features requested at the previous forum. Finished off with examples of good and bad practice. There was a Q&A session after each presentation and some excellent questions were asked and answered, these can be found in the videos which are being designed. Simon Harrison gave a guided hands-on session on how to build a dashboard using IBM Cognos 11.1 with working examples. Attendees were encouraged to test the software and see the new features including recommended charts, and how the infusion of AI has helped guide the processes. This was a request from a prior forum, and we hope to feature different software at each event going forwards. – Finance (Finance Directors, FP&A, Management Accountants, Analysts), – IT (Business Analysts, BI Managers, BI Developers, Data Science), – Operations (Business Leaders, Department Heads, Transformation Leaders). We’d love your input so we can mould the next forum around what you’d like to hear! Please request to join our LinkedIn Group here and have your say. Want to know what happened at the first #BAF 1? Or please contact us on the form below if you’d like to know anything specific.